should I use black landscaping mulch in a vegetable garden? The wood chips in the mulch are small. The mulch is sticky, like tar. No, mulch doesn't do much good in the garden. 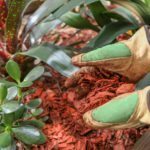 Especially treated black mulch, and also especially in the condition that you describe.